Today I’ll be taking a train up to Los Angeles, where I’ll be speaking at the BEAUTCHAT Beauty Class alongside some other awesome AB and K-beauty bloggers. I’ll only be in L.A. for two days and one night, but since I’ll be there for a special skincare event, I’ve had to give a lot of thought to what products I’m bringing and putting on my face. I chose products from my current lineup that I know I can rely on for the effects they produce. In my list below, I’ve also pointed out some alternatives for a few of the more expensive or difficult-to-find items. Wanna see? Affiliate links in this post enable me to receive a small commission on products purchased and are marked with an asterisk(*). 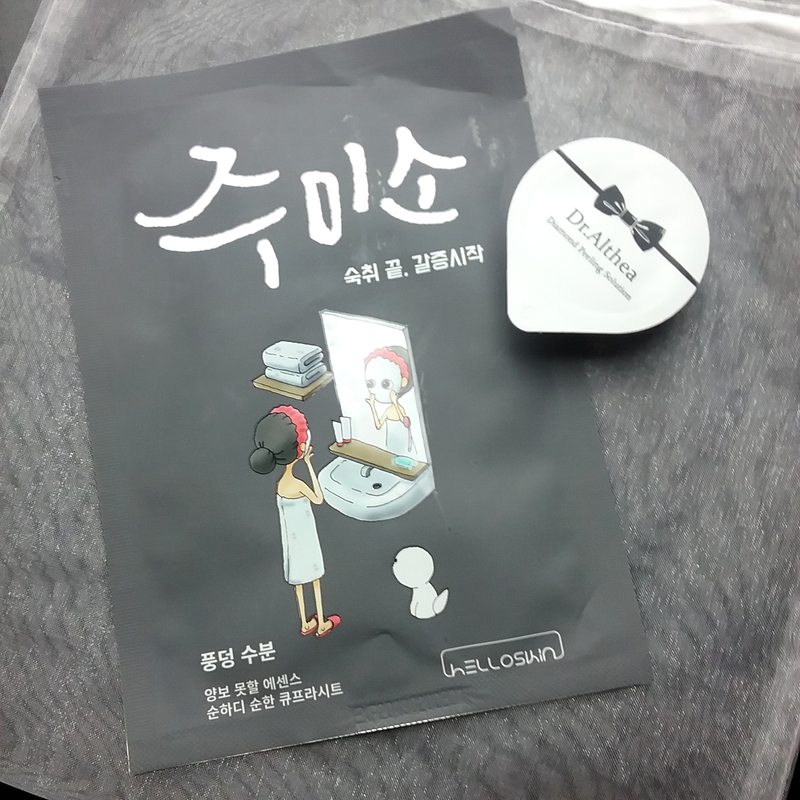 Some of the products in this post were provided by Fifty Shades of Snail sponsors and are marked with double asterisks(**). As much as it might look like I packed my entire stash plus the kitchen sink, the contents of my single mesh bag were actually carefully chosen–I left over half of my skincare basket behind, not to mention 99% of my current cream and sleeping pack options! Since I’m only going to be gone for one night, I didn’t bother to bring any actives. My skin won’t miss a night of those. Instead, since I want my skin to look its best right now for the special event I’m traveling to, I focused on products that I know have an immediate effect on my skin’s appearance–and a daytime routine that will work well with makeup. A beauty event that involves something called “Photo Time” is not a place for shiny slidey smeary makeup, white cast, flashback, or any of the many other things that can go wrong between moisturizer and foundation. Cleansing is non-negotiable, especially the night before the event. I’m going to need a fresh clean canvas to get the most out of the other products I’m bringing. 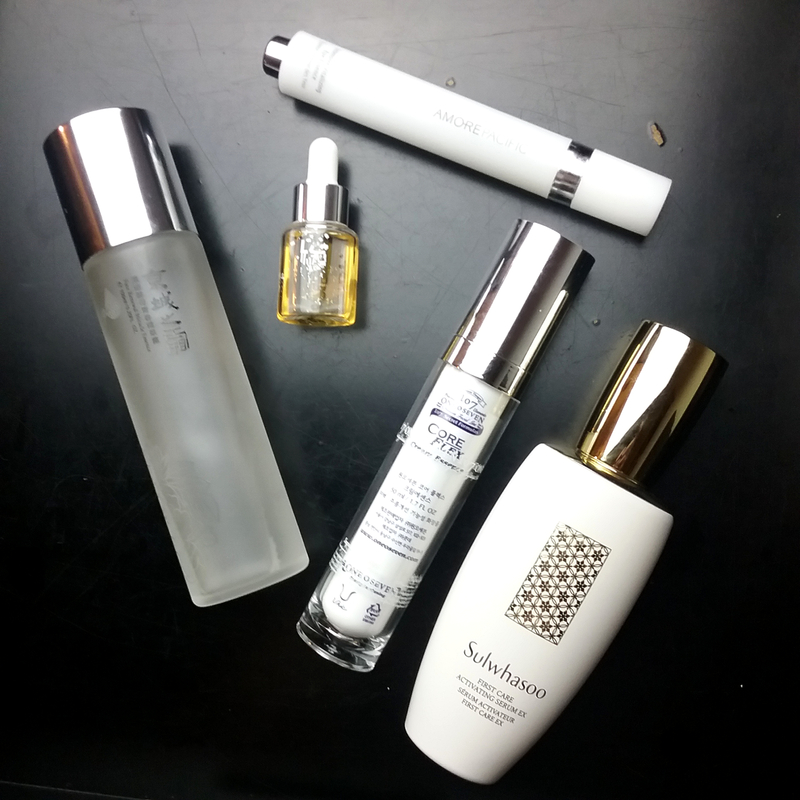 Essences and serums are where I look for the majority of my skincare “results.” If you’ve been reading this blog or following me on Instagram for a while, you’ll be familiar with most of my choices here. I expect to spend a lot of time in drying air-conditioned buildings, so I can’t skimp on moisturizers. I also need my moisturizers to multitask, since I want my skin to look 100%. For eyes: Unitouch Cherry Blossom Massage Eye Cream**. This is actually a newer addition to my routine, so I don’t have much to say yet about this Taiwanese product besides that it’s a nice, non-greasy eye cream that lightly moisturizes and fills in fine lines well. It doesn’t mess with my eye makeup, and my eyes don’t get crepey by the end of the day. Full review may come later, if I find it’s notable enough to cover in detail. Of course I’m going to mask the night before the event. Maximum results desired! For once, I don’t have much to say about my sunscreen choices. I’ve been working through the stash of sunscreens I was sent for my W2Beauty sunscreen feature. I’m down to the ones I disliked. Most of them feature a heavy, gloppy finish and white cast for days, and the only one left that dries clear also happens to dry with a greasy shine like a face dipped in cooking oil. (Graymelin Moisture Sun Essence**, if you’re morbidly curious.) 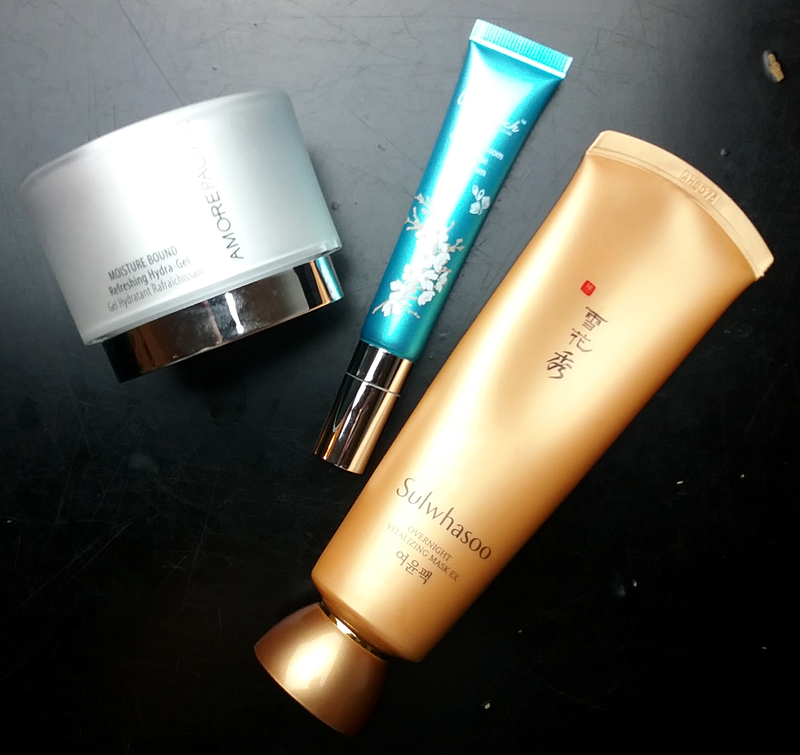 None of that is going to work for me, so I found a sunscreen I’d previously been sent by Shiseido’s US PR and had rejected for being too low-SPF. 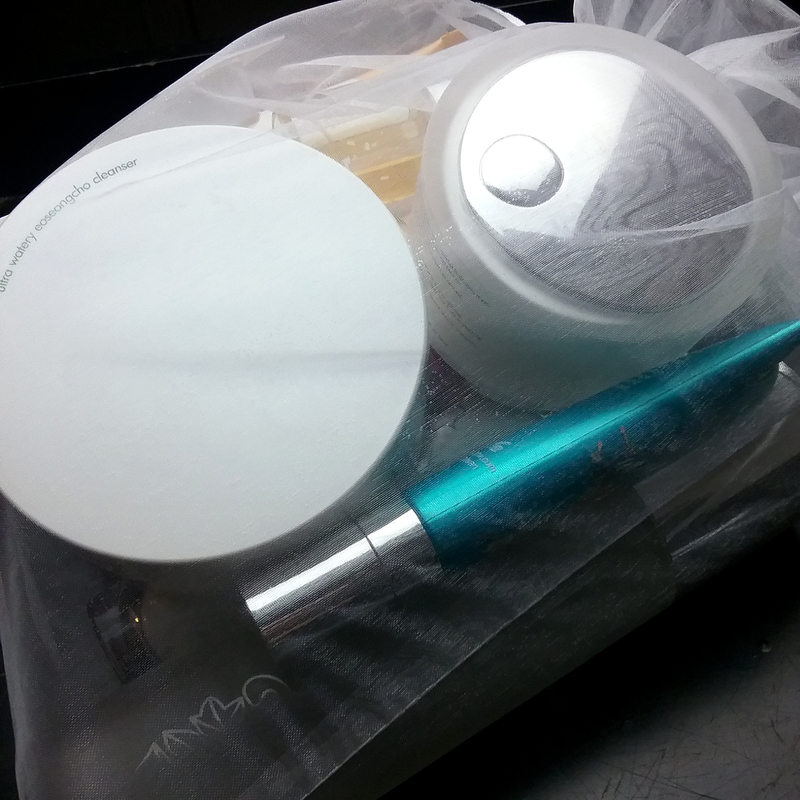 The Shiseido White Lucent All Day Brightener** is only SPF 23, but when I swatched it on my hand, it dried down light and non-greasy, and the initial white cast completely disappeared, leaving behind a kind of beige sparkle that can be easily addressed with my base makeup. Mostly, I’m just glad for the lack of grease and white cast. 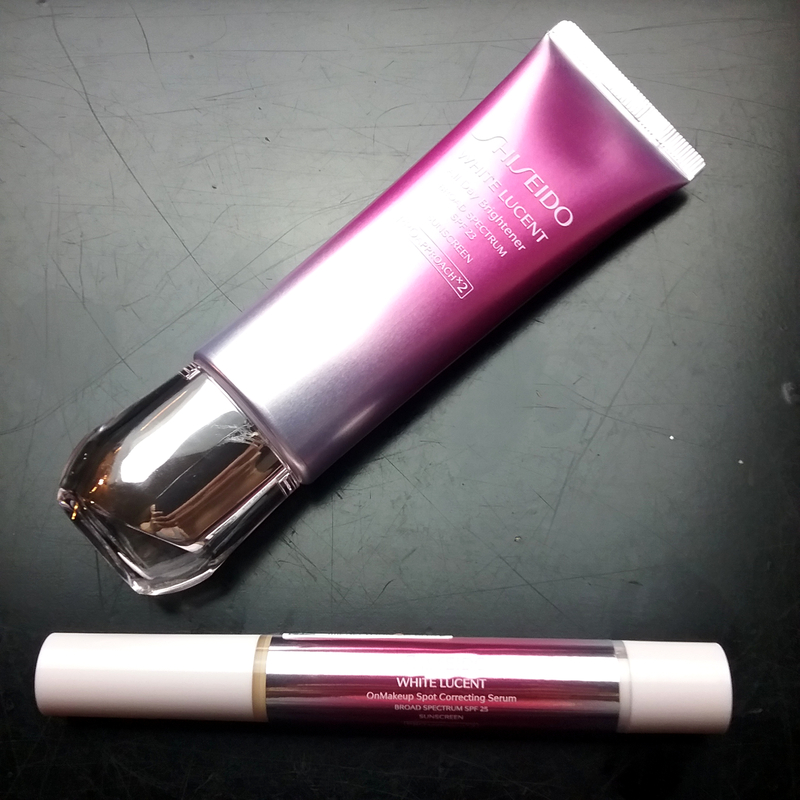 For extra fun, I’m throwing in the Shiseido White Lucent OnMakeup Spot Correcting Serum**, which is basically a tiny tube of SPF 25 foundation packaged as a sunscreen touch-up. It might come in handy. Who knows? I haven’t packed my Saturday outfit yet or given any thought to the rest of what I might need for the night or the next day, but now that my skincare is settled, I feel ready to go. Check my Instagram over the weekend to see the makeup I’m taking with me, the routines I put together from these products, and whatever shenanigans I get up to in LA! And stay tuned for the next phase of this blog. 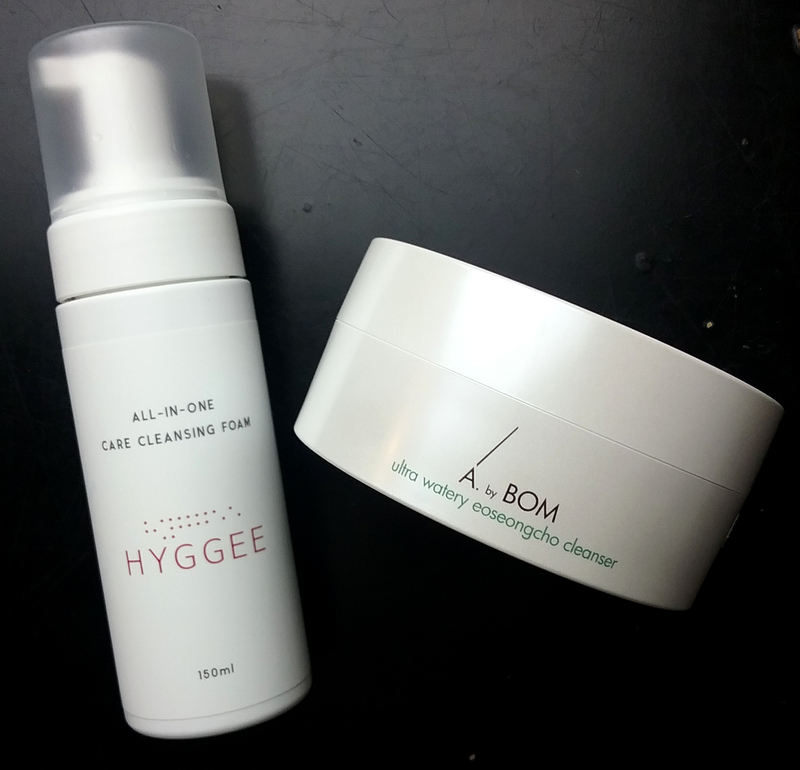 I’ve heard your feedback and am shifting direction to more reviews of affordable products, so I’m going on a quest for the best budget-friendly K-beauty and AB skincare I can find. Lots of fun ahead! I should really do laundry and pack now.